Drop shipping is a business model that lets you curate, market and sell a unique collection of products without any inventory, storage or staff costs. Shopify connects to hundreds of drop shippers via apps that automate every step, making it the quickest, easiest and most economical way to launch an ecommerce business. Oberlo is the most popular Shopify drop shipping app and is the best way to launch a Shopify drop shipping store quickly and with minimal cost. Oberlo helps you find and add products directly into your Shopify store so you can start selling right away. It’s also completely free to use with Shopify. Start a free 14-day trial. Below, we’ll show you how simple it is to set up a Shopify trial store, connect the free Oberlo drop shipping app and start building a collection of drop ship products. We’ll also explore other drop ship supplier apps that you can use to expand your collection and grow your drop shipping empire. The first thing you need to do is start your Shopify free trial. To open an account, visit Shopify and enter your email address, business name and create a password as we did below. If you’re not yet sure of your business name — or even your business concept — don’t let that stop you from test-driving Shopify and Oberlo. 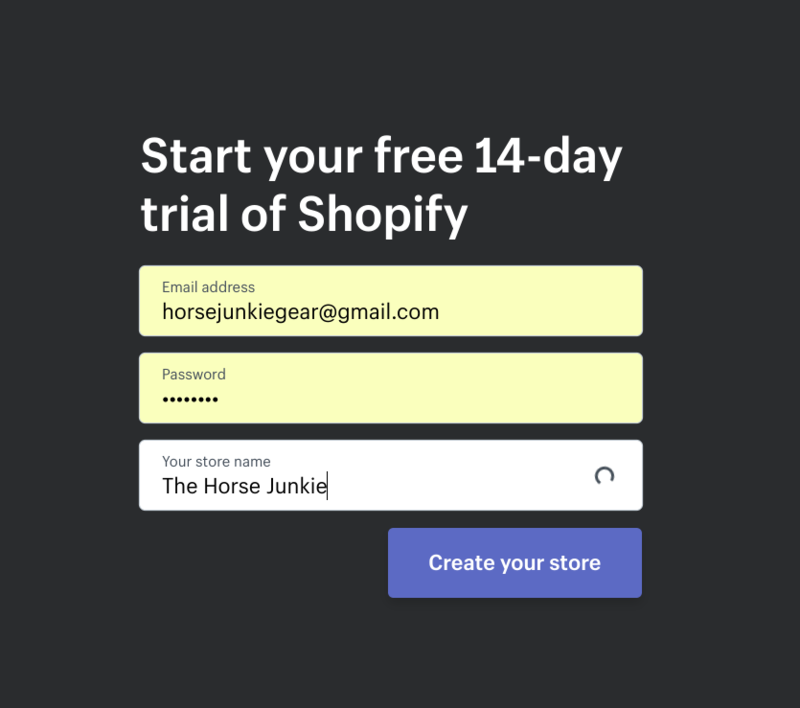 You can change your store’s name and even your email address at any time in your Shopify store settings. In fact, exploring drop ship products using Shopify and the Oberlo app is a terrific way to brainstorm and test different business ideas. For more on developing a solid business concept, read our guide on researching niche markets. 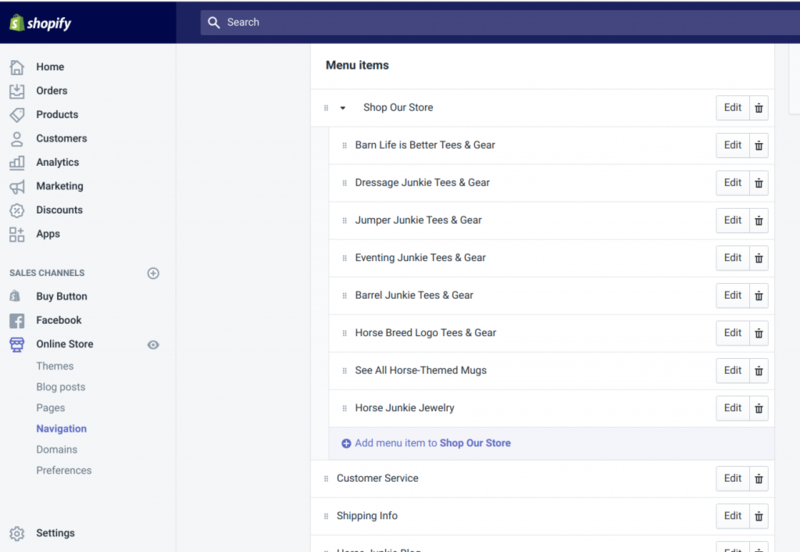 After you enter the information above, Shopify asks you a few details to set up your test store. As you can see, there’s no problem with telling Shopify that you’re just “playing around.” They know many successful sellers started this way. Next, Shopify takes you to your store dashboard. This guides you through basic setup steps: adding products and setting up your store theme (design) and domain (web address). We’ll cover theme and domain details in later steps. First, you’ll want to explore and add drop ship products to your Shopify store and, for that, you need to connect the Oberlo app. Since Oberlo is Shopify’s own, fully integrated drop shipping supplier network, it’s quick and easy to install and use. The simplest way to do this in a new Shopify store is to click on “Products” in the left menu. The following “Products” page will pop up. Here, click on the “Find Products” link and Shopify directs you to its Oberlo startup page. 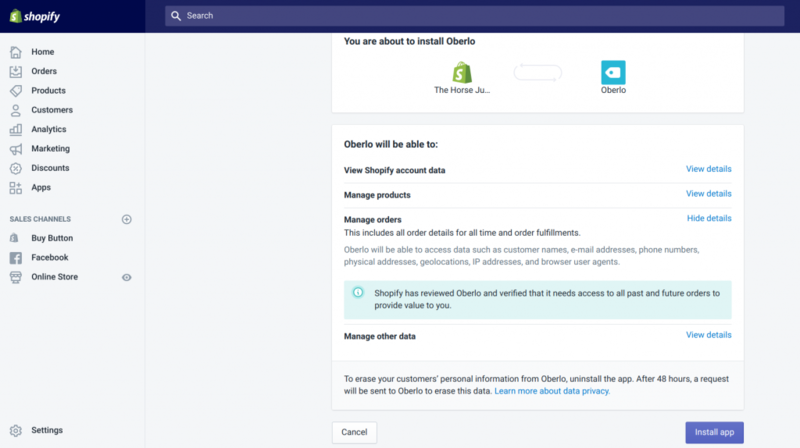 However, you get to Oberlo via the “Products” or “Apps” links, Shopify connects it to your store automatically once you click the button, so you need to click the “Install App” button. Within seconds, your new Oberlo drop shipping dashboard will pop up. Here is where you can explore products to sell in your Shopify drop shipping store, plus research top sellers, sort through niche-based items and brainstorm ideas. Note that in the lower left corner of the Oberlo screen, you can return to your Shopify dashboard at any time. It’s a completely seamless integration. Now, you’re ready to start searching for products. Once the Oberlo app is installed in your Shopify store, your product discovery fun begins. Oberlo’s intuitive interface lets you make broad or very specific product searches with a few keystrokes. It’s a good idea to start by exploring a variety of products related to your business idea (or ideas) and see what you come up with. 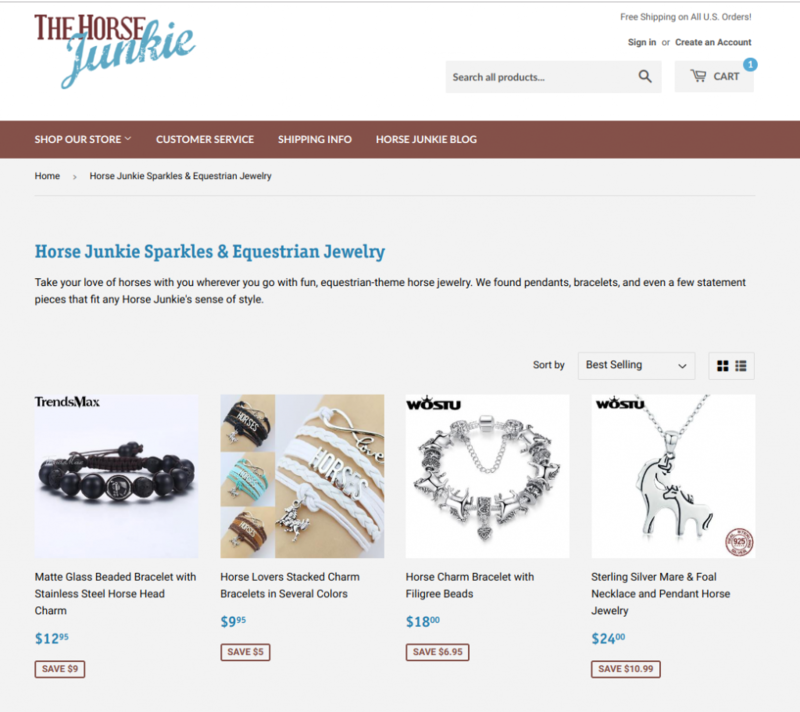 For example, our site, TheHorseJunkie, targets horse lovers and enthusiasts, so we start by searching the word, “horse.” This returns more than 1,000 products to browse through, from jewelry and horse grooming items to bags and apparel. 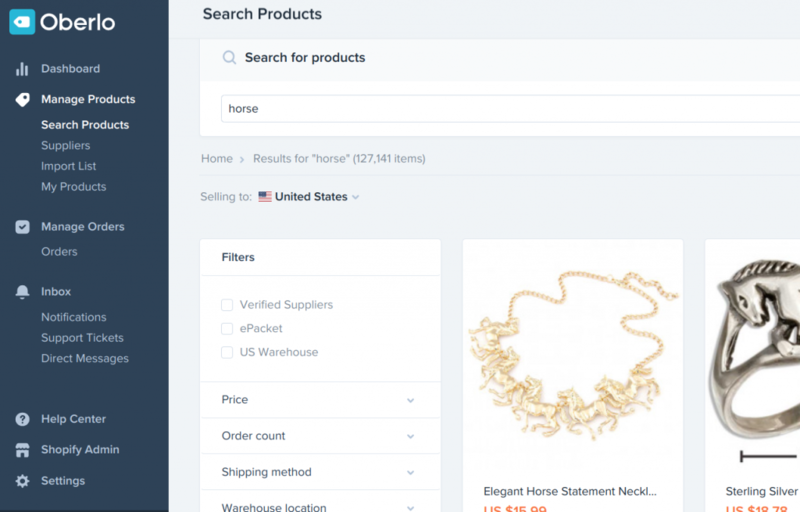 We can narrow our search using specific keywords like “horse bracelets” or “horse backpacks” or by using Oberlo’s “Filters,” which appear to the left of your product search results. You can test different Oberlo product filters to see what results they deliver. Generally, the Verified Supplier filter helps if you want to launch a drop shipping store with the most proven suppliers. However, you don’t have to limit yourself to Verified Suppliers. As you search products, you can see ratings and reviews for every item, including products listed on Oberlo by the biggest international dropship network, which is AliExpress. This can help you decide if an unverified seller is a good risk or not. Other filter options may or may not matter, depending on your store concept or audience. However, if you want to focus on U.S.-made drop ship items or perhaps sell customized goods, you can explore other drop ship partners too. We discuss alternate drop ship supplier options at the end of this guide. With these considerations in mind, starting with 10 to 20 items or so is a good goal to launch your Shopify drop ship store. This gives you a variety of products to import, promote and test without spending a load of time on setup. Following this advice, here’s how we selected and added a few starter items to our Shopify drop shipping store. 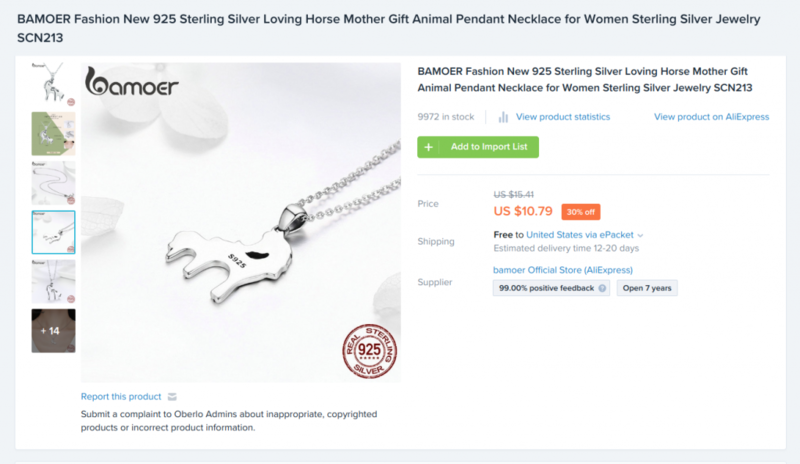 Using Oberlo’s product search for “horse,” we found a sterling silver horse pendant necklace that we’d like to sell. Based on the product brief, this necklace has good reviews from all sellers. We can quick-add the item by clicking “Add to Import List,” but we clicked on the item to see more information first. In Oberlo’s item detail page, we find product images, our cost (the “Price”), our shipping cost (free via ePacket) and expected shipping time — between 10 and 20 days. Scrolling down, we find more details like seller reviews (4.9 out of 5 stars) and the number of sales on Shopify stores (one in 30 days and 26 in six months). We can scroll even further to see if the supplier provides good product information that we can use in our sales description. With positive reviews, a good number of sales, quality images and plenty of details for our description, this item is a good fit with our brand. So, we click “Add to Import List,” then continue the same process to identify a few more products. 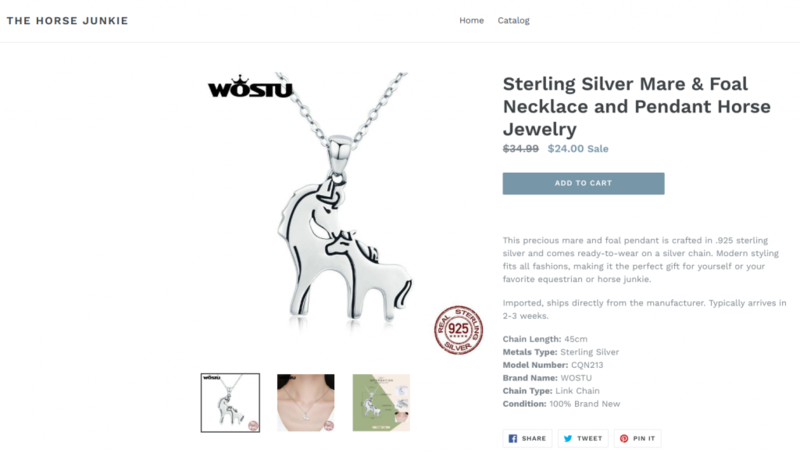 After searching Oberlo, we built an assortment of horse-inspired jewelry and home decor items to import into our Shopify store. These items sit in the Oberlo “Import List” until moved into Shopify. Before importing, we have the option to edit item titles and descriptions and review prices. We can also import them with the information provided by the supplier and edit them in Shopify or not at all. Since our list is short — just 13 items — we edit and review them in the Import List quickly, so that’s all done when they import into Shopify. To do this, we proceed through the four tabs on each item. Imported, ships directly from the manufacturer. Typically arrives in 2-3 weeks. Under “Variants,” we can see our item cost, shipping (this ships for free), suggested sales prices and projected profit and can make any changes to our selling price if we wish. Of course, pricing can be reviewed and changed anytime once items are imported into Shopify. If the item comes in different sizes or colors, that’s shown here too. You can also see the manufacturer’s stock keeping unit (SKU) number, which we leave as is. Under “Images,” we can select which manufacturer’s images we want to include in our upload by scrolling over any image and clicking the “+” sign. As you proceed through each tab, Oberlo automatically saves your changes. Then, when complete, a quick click on the green “Import to Store” button sends the item to your Shopify product list immediately. Here’s how our imported item looks like a live listing in our Shopify drop shipping store. It looks great, and we haven’t even set up our store yet. See what we mean when we say Shopify makes everything simple? After importing a few products from Oberlo into Shopify, the next step is setting up your Shopify Store from your Shopify dashboard. You can start by setting up Product Collections to organize your drop ship items for easier shopping. To do this, click on “Collections,” then “Create Collection” in your Shopify dashboard, and you’ll see this screen. 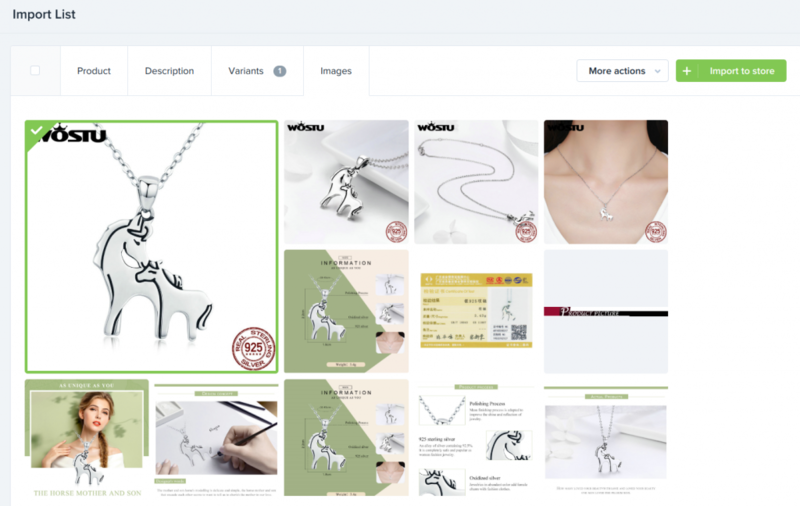 We need an Equestrian Jewelry section to house our drop ship jewelry items, so we enter a title and a quick description of the section in the screen. Scrolling down, under “Collection Image” we insert one of our item images from the products we imported earlier. Here, we can also name “Conditions,” which Shopify uses to add items to this collection automatically based on specific criteria. For this, we added jewelry-related keywords that we know we’ll use in our titles. However, you can set up your criteria, Shopify gives you many options. You can also elect to add items to collections manually. It’s up to you how you want to manage this. Shopify leads you through each of these setup steps within your dashboard, so we’re not going to cover this in great detail here. However, we’ll walk you through the process so you can see how simple it is to complete and launch your new Shopify drop shipping store. The entire process took us about one hour. 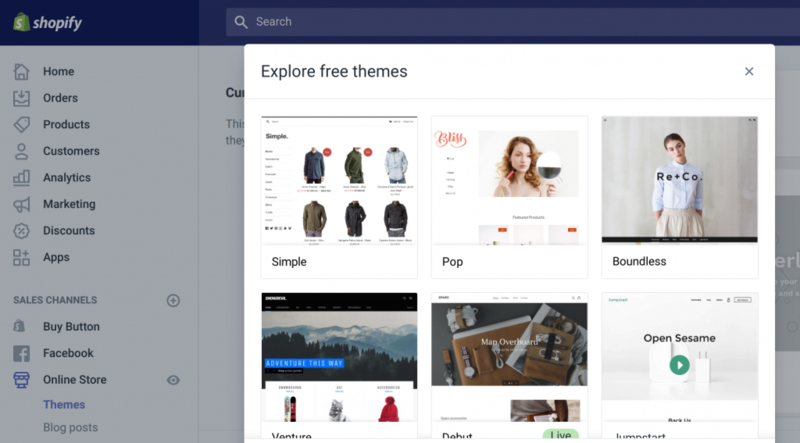 Shopify automatically applies a basic free “Store Theme” which drives the design of your online store. You can set up this theme or change it to another theme under “Online Store > Themes” in your Shopify dashboard. To see more free theme options, click “Explore Free Themes,” there are 10 clean, modern themes from which to choose. You can also browse paid themes, which start around $140. As a starter store, the free themes deliver everything you need. It’s best to stick with these to save money at first, then explore paid themes later on as sales grow. We chose the free theme “Supply” since it’s designed to display sites with larger inventories that we plan to build. Plus, it displays both collections and featured products sections on the home page. This might be a good one for your store, but it’s a good idea to check out all of the free themes to pick the best style for your brand. 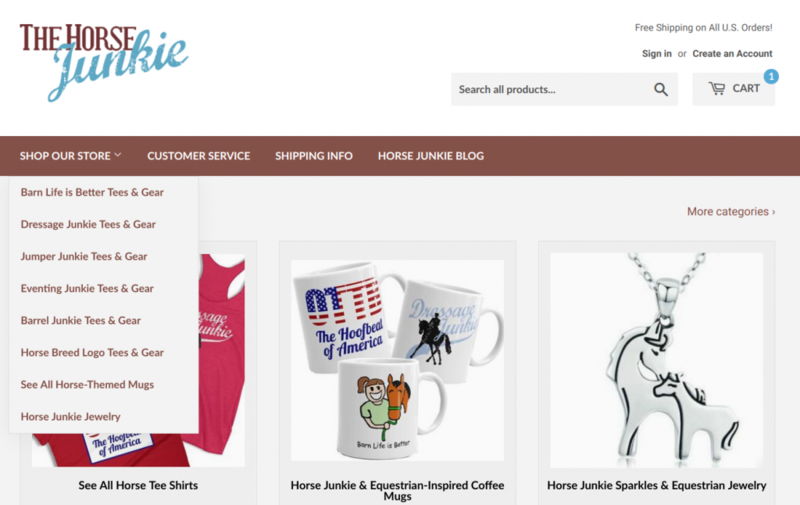 Once selected, we can start customizing our store theme by clicking the “Customize” button. Note: As shown above, Shopify keeps your store private until you’re ready to go live by using a password, and you’ll see this note as you proceed through the setup steps. You can find this password in your Store Settings and share it with friends or co-workers if you want them to view your site as you build it. Once your Shopify drop shipping store is complete, you disable the password to launch your live store. We followed Shopify’s edits list (on the left of the screen) and, within about an hour, completed customizing our store theme, including header, footer and homepage. We already had a logo to insert into our header. If you don’t yet have one, Shopify lets you create a tidy logo using the typeface of your choice. To get a custom logo for your store, try the budget-friendly logo designers on Fiverr. 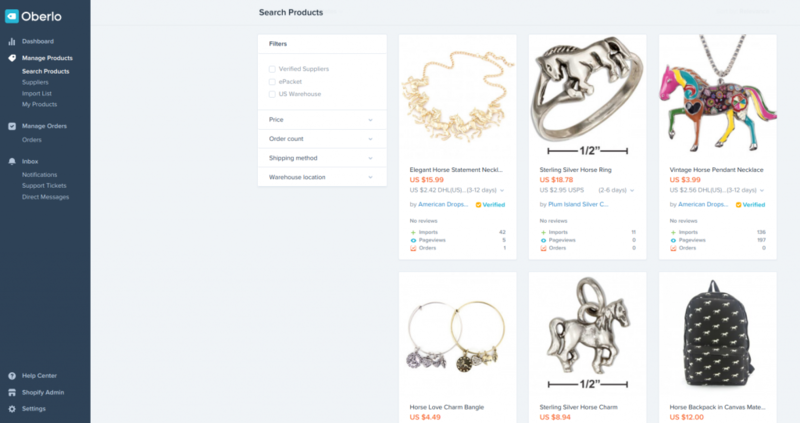 Here’s a look at our completed Jewelry Collection page, populated with our drop ship items from Oberlo. Here, we built out a “Main Menu,” which appears at the top of our site, by adding all product collections and key information pages. 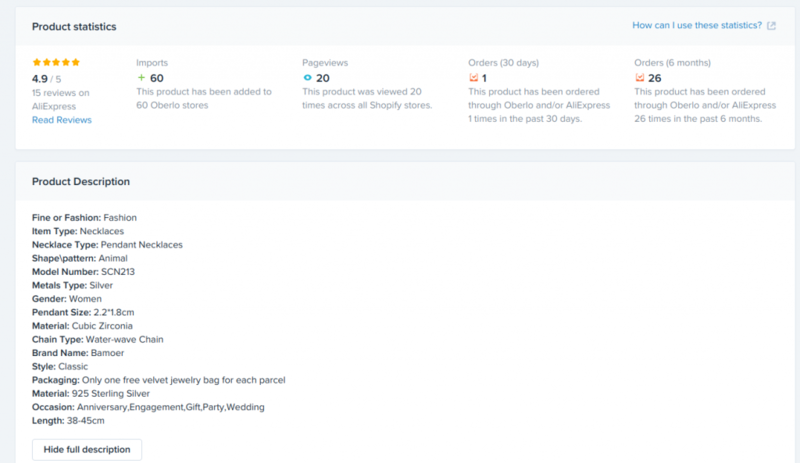 Shopify even let us drag and nest menu items to create drop-down menus, as shown below. It’s all very easy. As shown below, the menu we created includes a tidy pull-down navigation to our collections, plus gives shoppers quick links to our informational pages and blog section. With site setup complete, you’re ready for the final steps to launch your store. Shopify walks you each of these tasks in a few minutes. You can find links to the specific pages in the “Setting” tab, located on the bottom of your left-hand menu. Of course, there are other settings that you can explore on this page, but these are the three that you must attend to in order to launch your Shopify drop shipping store. However, it’s not very professional looking and certainly isn’t easy for a shopper to remember. You should have your own clean, memorable domain name, like ours. After completing this step, you’re ready to remove the password-protection for your store and go live. 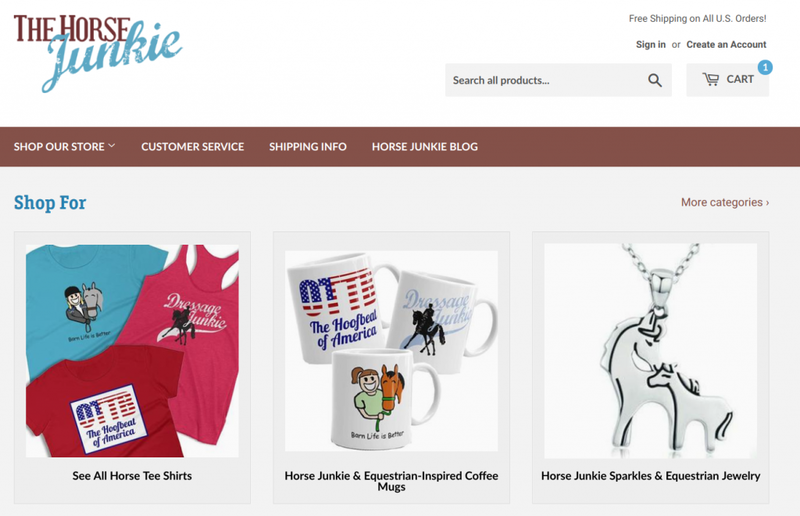 To do this, click “Online Store” and you’ll see your “Theme” page. Click “Disable Password” and your store will be live. It’s that simple. After your starter Shopify drop shipping site is live, you can start exploring a host of additional drop ship product options and marketing channels. Curating an interesting collection of goods and marketing them effectively is the key to drop shipping success. Shopify helps you with all of this, which is why they are our top pick for starting a drop shipping business. 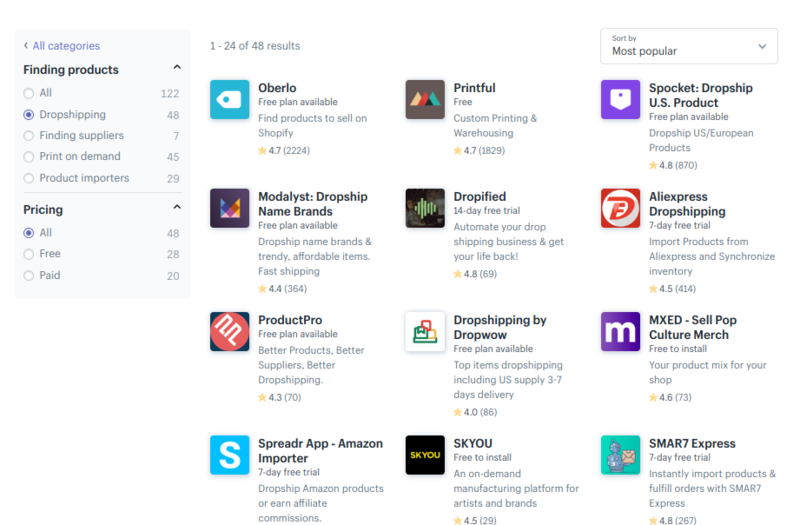 A quick search of Shopify’s App Store uncovers many different drop shipping supplier options that you can explore and test-drive as you grow. You’ll also want to expand your customer outreach using Shopify’s built-in marketing tools. Here are four channels that you can check out as soon as your store goes live. Of course, product line development, marketing and answering customer queries are ongoing tasks for any drop shipping business, but you’ll find that Shopify’s integrated platforms make these tasks as seamless as possible. Oberlo makes it easy to curate drop ship products, add them to your site, and launch a complete Shopify store in just hours. It’s completely free to use with Shopify and is one of the fastest and most affordable way to launch a drop shipping store. Start a 14-day free trial. To learn more about how the drop shipping business model works and the many ways that successful businesses use it, check out our drop shipping business guide. Thank you for a good write up. I’m just in the beginning stages of learning about Shopify and drop shipping. It looks like it will be a lot of fun creating and maintaining an ecommerce business online. I know that in order to be successful, marketing is key to be seen online and the question I have is how do you generate traffic to your site? Generating traffic is all about writing good content for your products, having other good content centered on your brand, and having good social media and, ultimately, email marketing. Getting traffic is an ongoing job for ecommerce sellers, but we cover many ways to do it in our Marketing section. Hope this helps! Good luck. The link to dropship or I should to find suppliers is not working. So u suggestion to help find dropship supplier? Sometimes those link pages change on the sites we point to, we’ll be updating this article soon to correct any bad links. Thanks for pointing it out. Shopify makes drop shipping easy with app integrations to numerous drop shipping suppliers – here’s the link to the drop shipper app list on Shopify. Good luck! If you set up dropshipping with Shopify, do the orders from your website get automatically ordered with the dropshipper or do I have to order it manually? Hi and thanks for reading! That depends on the wholesale drop shipping vendor(s) you work with. Larger vendors provide an app integration that takes care of everything for you. Orders for their products automatically route to them for fulfillment. After shipping, they update tracking information for you too. If you have your own vendors, say if you stock and ship items yourself and occasionally have your vendor drop ship a larger order for you, then you have to handle that manually. But, if you’re just looking to open a drop ship site, you can choose from several wholesale drop ship vendors that integrate with Shopify. Good luck with your drop shipping endeavor. As I understand, some orders may need to be fulfilled manually in the case that some sort of integration doesn’t exist from the supplier. In the case of manual fulfillment, how would you actually go about doing that? Say a customer orders something, you receive an email about it, what’s next? How would you go about placing an order with the supplier on the customers behalf? How you approach drop shipping depends on your business model. If you don’t already sell goods and have a stable of vendors, the best way to open a dropship business is to sign on with dropship companies that do nothing but dropship, like Doba, ALiExpress, Oberlo, and others. These all integrate with top ecommerce platforms so you can easily populate your store with products and the orders take care of themselves via the integration. But, if you already sell products and want to add select items but not stock them, or handle large orders via drop ship, then you can do both on a per-order basis. Of course, your vendor has to be willing to drop ship — most will do this for you, but not all. That’s how I handled large and special orders for my company for years. The trick is integrating those items into an automated purchase order system. This way, when an order was placed, the system automatically creates and sends a purchase order for that order, complete with the customer’s ship-to information, directly to the vendor. They then shipped it and provided me the tracking information which we updated to the customer’s order. Not all order management software supports this, but Ordoro does and handles this type of dropshipping beautifully — it’s what I used. Of course, you can handle ordering items that drop ship manually, but that’s a major time killer. Automation is the only way to do it without driving yourself crazy, believe me! I hope this helps answer your question. Good luck! Thank you for this in-depth step by step tutorial. Try Shopify FREE for 14 Days!